Human stem cells are yielding 3D miniature tissues that can be used to study both normal human biology and human disease in vitro. C. Y. Tachibana is a freelance science writer in Seattle, Washington. Stem-cell researcher Toshiro Sato places a culture dish under the microscope in his laboratory at Keio University School of Medicine in Tokyo. What he sees is not a sheet of cells, but something more complex — delicate spheres of tissue that are barely visible to the naked eye. These are organoids, 3D structures that develop when stem cells are given the proper environmental conditions to differentiate and arrange themselves into forms with properties similar to those of particular tissues or organs. Organoids can be derived from pluripotent stem cells, which have the potential to form any body tissue type — be it muscle, skin, gut or brain. When they are grown in the appropriate conditions, for example with specific growth factors, the stem cells self-organize into structures in which the different cell types are arranged similarly to the in vivo tissue. By contrast, organs-on-chips (OOCs) are generally made by arranging stem cells and cells that have already differentiated into the required cell types on a microfabricated device in positions and structures appropriate for the planned experiments. The difference between organoids and OOCs, says developmental biologist Madeline Lancaster at the MRC Laboratory of Molecular Biology in Cambridge, UK, “is self-organization versus construction” (see ‘Models in a nutshell’ box). Both organoids and OOCs also have potential in assessing the efficacy and safety of drugs, chemicals and cosmetics, with possible applications in regenerative medicine. For instance, a challenge in randomized clinical trials is how to compare the effect of treatments because the genetics and life history of the participants can affect how they react, notes Donald Ingber, founding director of the Wyss Institute for Biologically Inspired Engineering at Harvard University in Cambridge, Massachusetts. OOCs and organoids derived from patients’ cells can eliminate these confounding effects by creating intervention and control populations that have identical genetics and clinical history. However, the technologies are not without their challenges, such as how to scale up production to meet growing basic and applied research demand while maintaining the reproducibility and fidelity of the structure to the in vivo organs they represent. The pluripotent stem cells that researchers use to create organoids and OOCs include both naturally occurring embryonic stem (ES) cells and cells that are derived from differentiated cells such as fibroblasts and manipulated to revive their pluripotency, known as induced pluripotent stem cells (iPS cells). Lancaster, who uses organoids to study basic brain development and identify factors contributing to complex conditions such as autism and schizophrenia, says she uses ES cells for developing and testing protocols and new models. 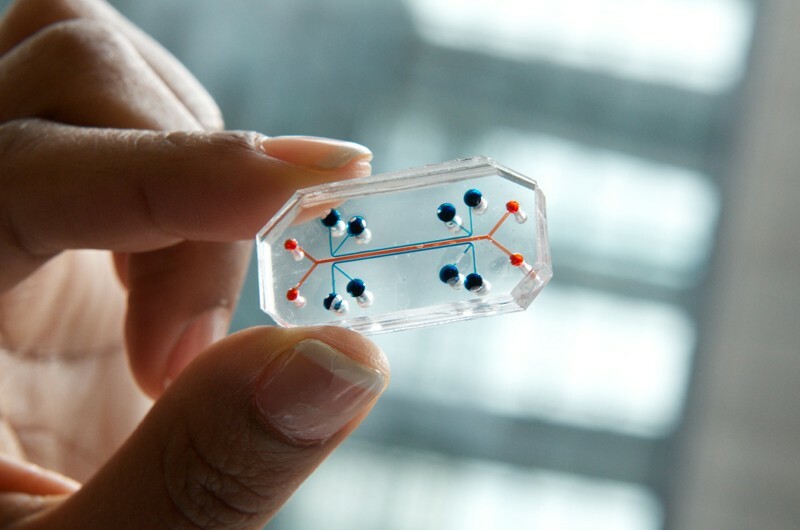 Organoids and organs-on-chips (OOCs) have applications in drug development, cosmetics testing, toxicology and personalized medicine. Here are some of their strengths and weaknesses. Origin: Generated from self-organizing embryonic stem cells (ES cells), induced pluripotent stem cells (iPS cells) or adult stem cells. Key strengths: Studies of developmental processes as single cells give rise to organs, including in disease. Key challenges: Increasing the reproducibility for applications that need a consistent outcome, such as drug testing, and finding ways to introduce or mimic vascularity. Tissue origin: Typically, cell lines or differentiated cells isolated from a person, but can also be derived from stem cells. Key strengths: Reproducibility and consistency. Can incorporate biomechanical features. Key challenges: Using iPS cells and stem cells from patients rather than cell lines, to increase applicability to personalized medicine. Organoids used to study genetic disorders or for personalized medicine are usually made from adult stem cells or iPS cells that have been manipulated to be specific to the patient. Geneticist Hans Clevers and his group at the Hubrecht Institute in Utrecht, the Netherlands, use organoids derived from intestinal stem cells to predict how people with cystic fibrosis will respond to various medications. Cystic fibrosis can be caused by any of several mutations in a single gene, CFTR. Therapies exist, but they are expensive and known to work only in patients with particular mutations. Clevers’s group is now testing organoids derived from the 600 or so Dutch people with cystic fibrosis without any of those mutations. The rationale is that if the drug causes the person’s organoids to swell under assay conditions, then the patient is likely to respond, too. Similarly, Sato was part of the team that developed methods for generating intestinal organoids from adult stem cells1. He is now involved in a clinical trial to test whether tissue made from eight patients’ own stem cells can safely be implanted into the gut to repair damage caused by the inflammatory disease ulcerative colitis. Organoids are also proving their worth in cancer research and drug development. The international Human Cancer Models Initiative is developing ‘next-generation’ organoid models, in which certain DNA sequences have been annotated. When combined with clinical data, the organoids allow researchers to link their findings to patient characteristics and outcomes. Daniela S. Gerhard, director of the National Cancer Institute’s Office of Cancer Genomics in Bethesda, Maryland, which is involved in the initiative, says that these organoids should become available from the American Type Culture Collection (ATCC) in Manassas, Virginia, later this year. About 150 different organoid models will be offered initially, and pricing has yet to be determined. The Hubrecht Organoid Technology biobank, of which Clevers is chief scientific officer, offers hundreds of different organoids derived from adult stem cells at €2,000–3,000 (US$1,700–2,600) apiece. Clevers and his colleagues have used organoids derived from colorectal cancer cells from 18 patients to test 83 anticancer compounds. Patterns of drug resistance in the organoids corresponded with known drug-resistance mutations, suggesting that organoids could be used to predict a person’s response to a particular drug2. Organoids derived from ES cells and iPS cells are ideal for studying complex developmental processes, Clevers says, but they can take weeks or months to produce; those made from adult stem cells tend to require less time. The shorter process is also less likely to introduce variation, so these organoids tend to be more reproducible than those derived from ES or iPS cells. The process of culturing organoids is similar to standard tissue-culture work. “New graduate students can easily grow them in a few weeks,” says Sato. “It’s easy to make something from stem cells,” adds Lancaster; the difficulty lies in the interpretation. It’s hard to be certain about which tissues are actually present in the resulting organoid. Sometimes called microphysiological systems or tissue chips, OOCs are based on structured microdevices called microfluidic chips, on which cells can be maintained in culture. 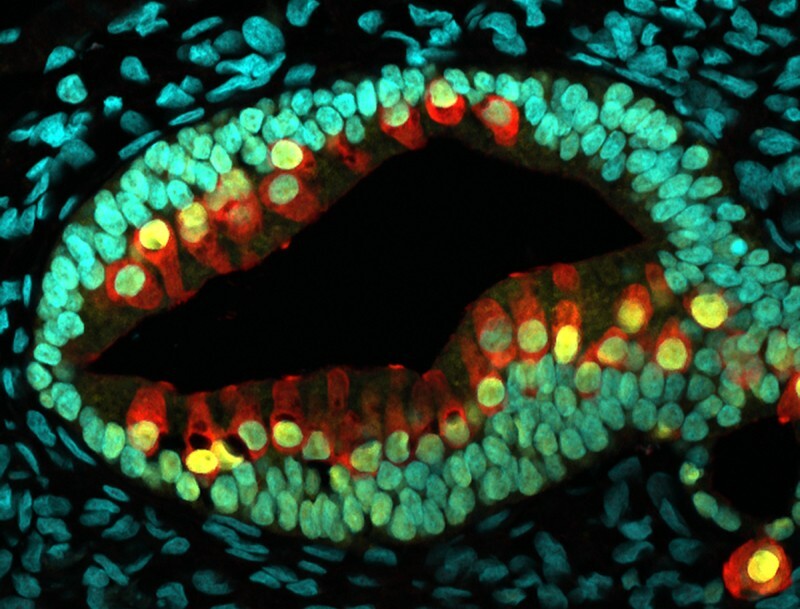 Unlike organoids, which develop spontaneously from stem cells, an OOC is designed. The structure of the chip and the type and placement of cells determine the tissues that emerge and their arrangement. That means they are generally more consistent than organoids, says bioengineer Boyang Zhang at McMaster University in Hamilton, Canada. And OOCs can be more sophisticated, too, because developers can add engineered elements, such as sensors, ‘vasculature’ to promote fluid and gas exchange, and features that facilitate imaging, that cannot spontaneously arise in organoids. Some tissue chips are available commercially. Bioengineers developing OOCs can get their starting chips made to order by commercial fabrication facilities and on-campus machine shops. A research team at the Wyss Institute has created ‘hearts-on-chips’ using microscope-slide coverslips coated with a synthetic polymer. Starting with iPS cells from people with Barth syndrome, a form of congenital cardiac disease, the team first coaxed the iPS cells to differentiate into heart-muscle cells (cardiomyocytes) and then grew those on a chip to produce tissue that they could test for function. The researchers were able to show that a mutation associated with Barth syndrome caused the cardiomyocytes to function abnormally. They were also able to correct the defect in vitro3. TARA Biosystems in New York City, which was co-founded by Zhang, produces a cardiac OOC called Biowire for drug testing. TARA scientists take cardiomyocytes derived from iPS cells and place them in a microdevice containing a fine wire around which the cells grow. That helps the cardiomyocytes to align in the regular arrangement required for function. The developing ‘muscle’ can then be electrically stimulated to become mature heart muscle that can contract and relax, mimicking the functioning of real heart tissue. Treatment with adrenaline, for example, increases contraction. Nortis near Seattle, Washington, creates OOCs by solidifying a collagen matrix around a glass fibre, which is then removed to produce hollow channels that are several millimetres long and about 100 micrometres in diameter. Once the tubes are seeded with cells, tissues form within days. A single-use chip, which can run three parallel experiments, costs $300. The use of stem cells to generate tissue for OOCs will become more prominent because of their potential for regenerative and personalized medicine, says Nortis chief executive Thomas Neumann. But generating tissue from stem cells introduces issues if cells do not fully differentiate or mature, so quality assurance will become even more important, he says. OOCs can be engineered to have levels of complexity that organoids generally cannot match. They can, for example, be made to mimic physiological properties such as tissue stretching, pulsation and peristalsis. Ingber launched the OOC field in his 2010 paper4 on micromodels of the lung capillary–alveolar interface, coined ‘lungs-on-chips’. The chip has channels separated by a membrane that has alveolar cells on one side and vascular cells on the other. Breathing can be simulated by applying and releasing vacuum to side chambers. “The mechanical micro-environment is critical for getting in vivo-level function,” Ingber says. The team has used the simulated breathing system to test the toxicity of nanoparticles. OOCs can also be linked together to create multi-organ ‘body-on-a-chip’ models. Michael Shuler and his bioengineering team at Cornell University in Ithaca, New York, have produced a single, closed OOC system with 14 chambers to represents organs with ‘barrier’ functions such as those seen in the lungs, and ‘non-barrier’ functions similar to those in the heart5. Bioengineer Linda Griffith at the Massachusetts Institute of Technology in Cambridge and her team have built a ten-organ system in which material can flow from one organ to another, as it would in the body6. Some organs, such as the ‘brain’, originated from iPS cells; others, including the ‘liver’, came from cell lines or other differentiated cells. The tissues remained viable for up to four weeks, and the system displayed biological functionality. For example, a drug introduced into the gut tissue was passed to the liver, where it was metabolized. The project, Griffith says, involved a great deal of cost, effort and multidisciplinary coordination, requiring not only bioengineers and mechanical engineers, but also modellers to translate how the data from the chips apply to humans. In practice, Griffith says, scientists generally work with just two to four linked chips. Developers of OOCs are now setting their sights on demonstrating the value and validity of the technology to industry and to regulatory agencies. Scaling up the use of OOCs will require manufacturing-friendly formats for production and high-throughput applications. One challenge for linked OOC systems is finding culture media and conditions that serve all tissue types — media that support liver cells are not always suitable for lung cells, for instance. Achieving accurate models also requires adjusting the numbers of cells and activities of the various chips so that they accurately represent how those organs would work in a full-sized human. But, in general, Ingber says, the field is becoming more user-friendly. “It’s getting to the point where it’s plug-and-play, and you don’t need to be a microsystems engineer,” he says. Ingber’s group has used OOCs similar to its lungs-on-chips to create lung airways-on-chips to test the effects of cigarette smoke. The model allowed the researchers to compare gene-expression profiles of tissues from the same human donors with and without exposure to smoke7. Sato, T. et al. Nature 459, 262–265 (2009). van de Wetering, M. et al. Cell 161, 933–945 (2015). Wang, G. et al. Nature Med. 20, 616–623 (2014). Huh, D. et al. Science 328, 1662–1668 (2010). Miller, P. G. & Shuler, M. L. Biotechnol. Bioeng. 113, 2213–2227 (2016). Edington, C. D. et al. Sci. Rep. 8, 4530 (2018). Benam, K. H. et al. Cell Syst. 3, 456–466 (2016).